If you are visiting the Hicksville area, then you already know that there is a lot to see and do. From the local Cantiague Park, which is packed with activities to the Palm Casino’s USA, you do not have time to deal with dental pain and problems. Fortunately, there are many emergency dentists in Hicksville that are ready to work with you and provide you with the care you need. Emergencydentistsusa.com is committed to making sure that you have the information you need on hand and ready when you want to access it. We have created a comprehensive list of emergency dentists in Hicksville that are available and accepting new patients. You can view this list conveniently online. If you are unable to access the Internet, do not fear, you can contact our toll-free dentist finder hotline. Our team members are ready to assist you and provide you with the help you need locating an emergency dentist in Hicksville. We will schedule your first appointment for you as well! In Hicksville, there are many choices for emergency dentists. Whether you experience intense pain or you simply have a question about your health, these dentists are ready to help you. You will be able to quickly identify emergency general dentists, pediatric options, and even emergency oral surgeons. Below, you will learn more about the different types of emergency dental offices and also see our three favorite picks for Hicksville emergency dentists. Description: Great Smiles of Hicksville is committed to keeping you comfortable at all costs. We want you to know that dental procedures do not have to hurt. If you are experiencing a dental emergency, our dentist is ready to see you here in our office. We will not only alleviate your pain, but also treat the condition. Our warm, comfortable, small office is dedicated to superior dental services. Description: At Great Neck and Mid-Island Dental Associates, we are committed to making sure that all of our patients receive the quality dental care they need. We specialize in endodontics, pediatric care, and elderly dental procedures. Our team does offer emergency dental services for those patients who experience a severe toothache or those who have cracked or knocked their teeth out. Description: Broadway Dental is committed to making sure that you receive the best dental care in all of Hicksville. We offer comprehensive dental services to include emergency services, should you find yourself in a position where you need them. We specialize in sleep apnea treatment as well. 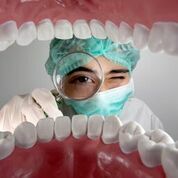 No matter what dental problem you may face, our team can help. Tooth pain can vary from mild to quite severe in nature. No matter the type of tooth pain you experience, it is often the first sign that there is a problem. You should seek out immediate emergency dental care at the first sign of severe pain. If you have been involved in an accident, do make sure you visit the appropriate facility to check you for any serious injuries such as a broken jaw or other broken bones. Before you visit any new dentist, you should research the dentist and make sure that their credentials and licenses are active. To do this, you can inquire with the receptionist when you arrive for your first appointment. Another option is to visit the New York Dental Association website and perform a search of the dentist’s name.